A joint research team from the National University of Singapore (NUS) and Indonesian Institute of Science has described an unusual new songbird species. The bird was named the Rote Leaf-Warbler Phylloscopus rotiensis after the island of Rote where it is found. The discovery was published in the journal Scientific Reports on 23 October 2018. Rote Island is a dry monsoon island with an area of 1,200 square kilometres in eastern Indonesia. It is around 12 kilometres off the coast of Timor, and about 500 kilometres northwest of Australia. The island is also the site where a bird species new to science, the Rote Myzomela Myzomela irianawidodoae, was recently discovered, and the findings were published in the journal Treubia on 31 December 2017. The presence of a leaf-warbler of unknown identity on Rote was first noted in December 2004 by Dr Colin Trainor from Charles Darwin University, Australia. In July 2009, Mr Philippe Verbelen and Ms Veerle Dossche, two Belgian birdwatchers, made detailed observations and obtained a series of photographs of the bird. 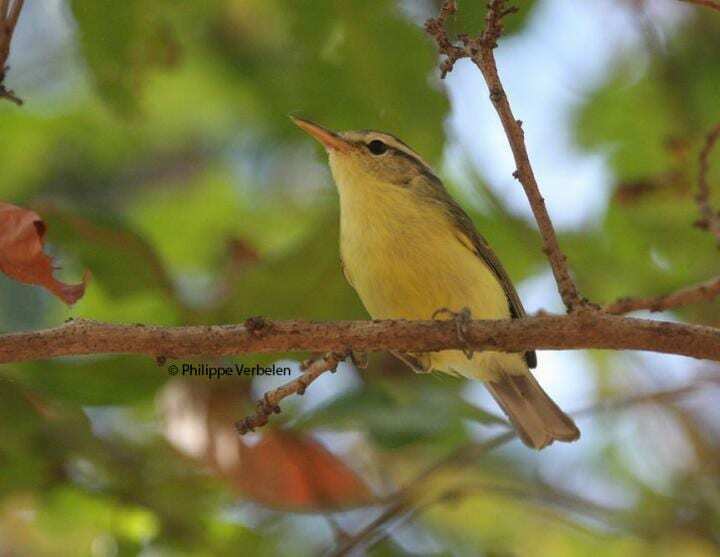 "Alarm bells went off when we realised how strikingly different the bill shape and the colouration of the Rote bird were compared to all other leaf-warblers," remembered Mr Verbelen. "The new species is part of a large group of Asian warblers but is unique among them due to its unusually long bill," said Dr Nathaniel Ng, who was involved in the description of the bird during his PhD candidature at the Department of Biological Sciences at the NUS Faculty of Science. He added, "This odd bill shape is likely an adaptation to Rote's dry landscapes, given that most other Asian leaf-warblers live in humid forest." The scientific description was partly aided by comparisons using genome-wide data collected through Next-Generation Sequencing. "This may well be the first time – to the best of our knowledge – that a new bird species has been described partly on the basis of genome-wide DNA data," added Miss Elize Ng, a researcher with the Avian Evolution Lab (AEL) under the NUS Department of Biological Sciences. "This work would not have been possible without the partnership with the Indonesian Institute of Science, and in particular, with Dr Dewi Prawiradilaga," said Assistant Professor Frank Rheindt, the leader of the study and Head of the AEL under the NUS Department of Biological Sciences. Each year, about five to 10 new bird species are described worldwide. The fact that this bird is the second novel species described from Rote in the last 12 months highlights the island's conservation value. Rote's natural landscapes are under grave threat, with a burgeoning human population exerting ever-increasing pressures on its monsoon woodland and savannah. These factors prompted the research team to propose the bird to be formally classified by the International Union for the Conservation of Nature (IUCN) as vulnerable. Dewi Malia Prawiradilaga, Pratibha Baveja, Suparno, Hidayat Ashari, Nathaniel Sheng Rong Ng, Chyi Yin Gwee, Philippe Verbelen and Frank Erwin Rheindt. 2017. A Colourful New Species of Myzomela Honeyeater from Rote Island in eastern Indonesia. Treubia. 44; 77-100.